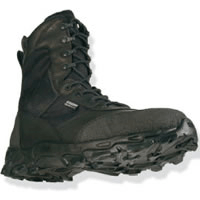 Comfortable non-metallic boots with waterproof SympaTex® barrier – Blackhawk Warrior Wear Black Ops Boots are fast, light, comfortable, non metallic and entirely waterproof. Waterproof SympaTex® barrier and gusseted tongue keeps out water. 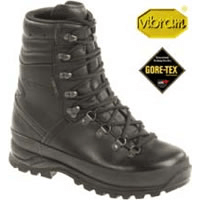 Excellent traction on irregular surfaces – Blackhawk Warrior Wear Black Ops Boots feature Vibram® ‘Multisport’ oil resistant TC4+ compound outsole has large, open lugs for traversing debris and provides excellent traction on irregular surfaces. Blackhawk Boots – Breathability – Blackhawk Warrior Wear Black Ops Boots have a unique open cell structure that enables air to travel through and around the insole creating a cooler environment inside the shoe. OrthoLite® foams offer up to 95-100% breathability for maximum ventilation in and around the foot. 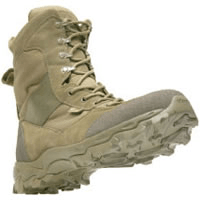 Great desert combat boots from Blackhawk – These Blackhawk Warrior Wear Desert Ops Boots are ideal for the riggers of Iraq or Afghanistan and are used by the Military and private security sector. Waterproof, light and durable – Blackhawk Warrior Wear Desert Ops Boots feature water resistant Cordura® and high abrasion suede upper for rugged durability. Cordura® panels breathe for comfort and help to reduce weight, a must for tactical operations. Functional boot with higher leg and Gore-Tex, one of the best combat boots in the world – The Lowa Combat GTX Boots is a functional Gore-Tex® special boot corresponds to the Lowa Mountain GTX Boot in all its properties and design, except the Lowa Combat GTX Boot is designed with Lowa’s AWP (Asymmetric Walking Position) and has a slightly higher leg. The higher leg of the Lowa Combat boots gives additional support to users requiring that little extra confidence when tackling those ‘above the norm’ duties. 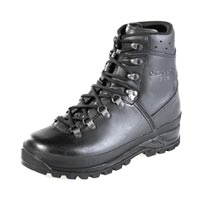 In fact, the Lowa Combat GTX Boots are widely purchased by dog handlers and firearms teams, plus Military, Police and Close Protection units worldwide. Lightweight military, police or close protection duties – Lowa Supercamp Boots offer support and flexibility and as with all the Lowa boot range the Supercamp is recommended on a regular basis by Doctors wishing to fit servicemen and woman in a correctly fitting boot; the Lowa Supercamp Boots are better for your feet, ankles, knees, and back. 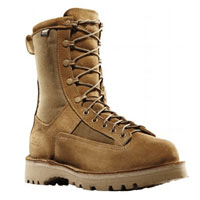 Danner Desert Acadia Hot Military Boots in Mojave Olive are suitable for use in Desert/Green zones, such as in Afghanistan, where desert turns in to farmed fields and compounds. Built to serve, and USA-made the Danner Desert Acadia Hot Military Boots in Mojave Olive has a full-grain leather and 1000 Denier nylon exterior for rugged durability. Dri-Lex® lining provides excellent heat mitigation. With Rough out, full-grain leather upper the Danner Desert Acadia Hot Military Boot offers serious protection and toughness and is designed specifically for hot weather conditions, providing mildew resistance, breathability, and low water absorption.